Children will enjoy these popular folk songs and dances from many lands. Traditional techniques and patterns are the basis for these activities. However, they have been simplified, structured, and slowed down to accommodate beginners. The melodies are familiar favorites of the various nationalities represented, and the lyrics that describe the actions encourage children to sing along. The lively arrangements promote an enthusiastic atmosphere for folk dance fun around the world. The instrumentals can be used to reinforce the dances on cuts 1 through 9, for adaptations of a dance, or as background for a variety of other activities involving international themes. 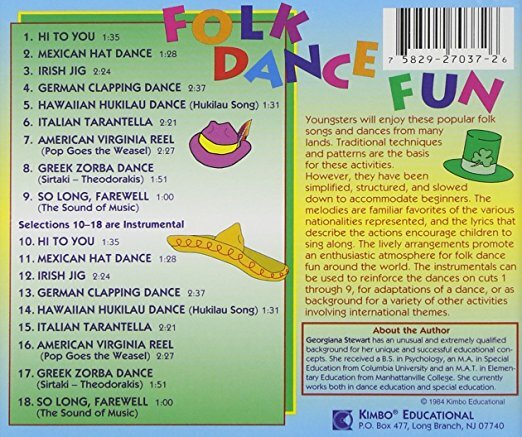 A cross-cultural collection of popular and unusual folk dances covers the world from America to Scotland, Korea, Russia, Switzerland and other countries. Extend the curriculum with dances and creative play.